Tomorrow, a crew of museum enthusiasts and fundraisers will walk the Museum Marathon around London to raise money for Guide Dogs UK. I know personally what a difference a guide dog can make to someone who is visually impaired. Guide dogs enable people to do things many of us take for granted – cross the road safely, walk down a busy street, get on the bus to go to work, or go shopping. 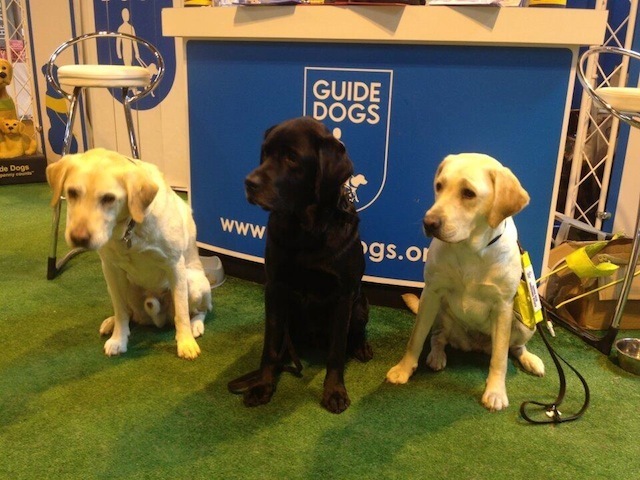 Guide dogs give back people who are visually impaired their independence. They are also great pub companions, crazy about going for ‘free runs’ in the park and enjoy sitting on sofas when they know they shouldn’t! They're cute too. Look at that photo. Aw. The route starts at the V&A and ends at Shakespeare's Globe taking in the Natural History Museum, Science Museum, Churchill War Rooms, Household Cavalry Museum, Benjamin Franklin House, London Transport Museum, the Library and Museum of Freemasonry, British Museum, Brunei Gallery, Grant Museum, Wellcome Collection, British Library, Foundling Museum, Charles Dicken's House, Sir John Soane's Museum, Hunterian, Courtauld Gallery, Museum of London, Guildhall, Bank of England Museum, 19 Princelet Street, Tower of London, Design Museum and HMS Belfast. A photo will be taken at each. Although the walk is at capacity, you can support them by making a donation at the Just Giving page and follow their progress on Twitter @Museum_Marathon. What's more, you can borrow the idea for your own fundraising, or just for fun at museumlines.com (but please make a donation as a thank you).